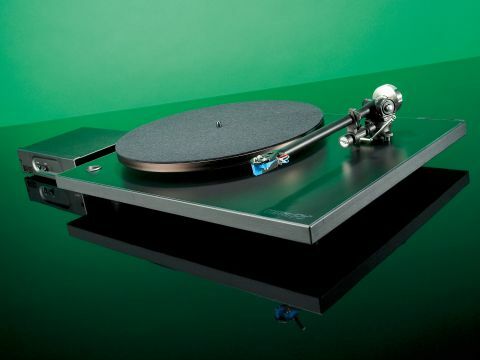 Few hi-fi components have lived longer or exerted greater influence than Rega's Planar 3 turntable. Its absolute simplicity helped inspire the 'back to basics' movement that rejected the complexities of much imported hi-fi, thus re-establishing the specialist British hi-fi industry that thrives today. The Planar 3 has undergone many changes over time, but Rega's new P3-24 is intended to replicate the original Planar 3's ability to provide genuine high-fidelity performance at an 'entry level' price. The design is deliberately simple, with a relatively light plinth stiffened by phenolic laminates, rigidly joined to the precision main platter bearing and arm base, and a decoupled Perspex cover. There's no environmental isolation, so a wall shelf is the best siting option. The 24V synchronous motor is mechanically isolated and driven via a plug-top mains transformer. A more sophisticated outboard power supply, the TT PSU, is an optional extra that costs £148. The platter itself is thick, heavy glass, topped by a 2mm-thick wool mat. It comes with a RB301 tonearm, but can also be supplied with an Elys 2 moving-magnet cartridge for £100 extra. With an Elys 2 installed, the output was fed to a Phonosophie Bi-Amp 1-4 amp equipped with a moving-magnet board and fed to KEF Reference 201/2 speakers in two-channel stereo mode. Sound quality is broadly satisfactory - free from any obvious distortions or unpleasantness, albeit with the obvious lack of precision that's to be expected at this price level. The deck loses some resolution towards the top and bottom ends of the audio band, and the midrange isn't without a degree of coloration either. The stereo image is a little vague, but essentially the musical quality of vinyl replay comes through in full measure, with expressive voices, excellent timing and a superior sense of musical flow. To some extent the cartridge might well be a limiting factor, lacking the high-frequency delicacy of moving-coil types. The effect of the upgraded power supply is instantly impressive, and goes a long way to countering most of our criticisms. The image sharpens up noticeably, giving tighter focus, more precise locational information and greater stability. Midband voice coloration is reduced, and resolution greatly improved at both frequency extremes, especially at the high frequency end of the spectrum. The P3-24 on its own is an impressive beast, but by adding the TT PSU - initially or at some point in the future - you can upgrade its performance to a whole new level.